The good news is that WebMAP solves most of your problems, by an enormous amount of cumulative cleverness from our development team. And we do it all with source code, not voodoo binaries. What if we migrated our HelloWorld app from part 1 to the web, using WebMAP? What would that look like? Which super-complex method, described in Part 1, did we choose to create this amazing web app? That's it. 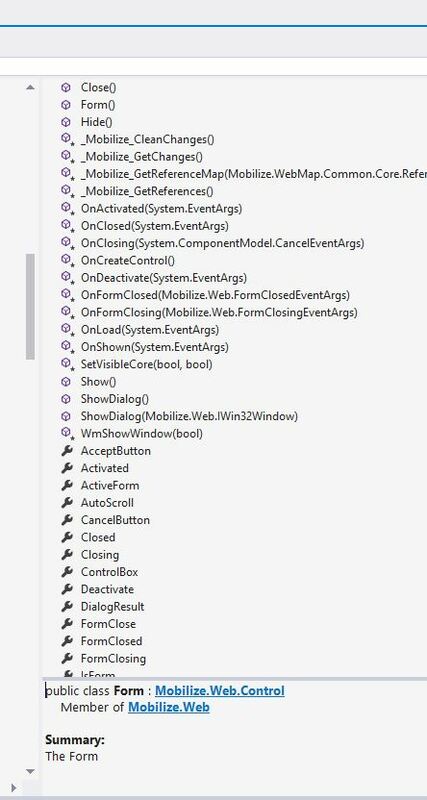 No controllers, no views or viewmodels, no models, just what appears to be almost exactly the same code that worked for a desktop app. How is this possible? Remember Julie Andrews singing My Favorite Things in "The Sound of Mucus"? Ok, so this should make Julie pretty happy--lots of packages. 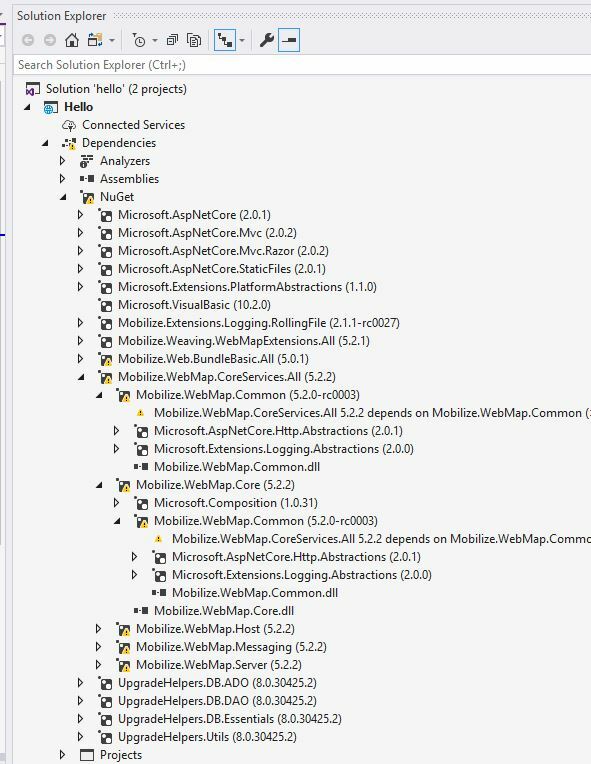 And this is where the magic happens in WebMAP--these DLLs let the server side code be highly decoupled from the web server housekeeping and the client side. The other big change referenced above is the Observable attribute we see for the class Form1. Now you've got to get your geek on. Likewise, in our designer file (Form1.Designer.cs), we'll find a different attribute on the class: [Mobilize.WebMap.Common.Attributes.Intercepted]. In this class we create all the visual controls that will be on our form. The Intercepted attribute tells the Visual Studio compiler that this is a place to inject code. You've probably used inversion of control (IoC) AKA dependency injection in code somewhere, right? Well, this is very similar. You may already be familiar with it: Aspect-oriented programming or AOP. AOP allows us to "de-clutter" the code you have to deal with from all the complexities needed to handle issues common to web applications. Like, for example, modality. 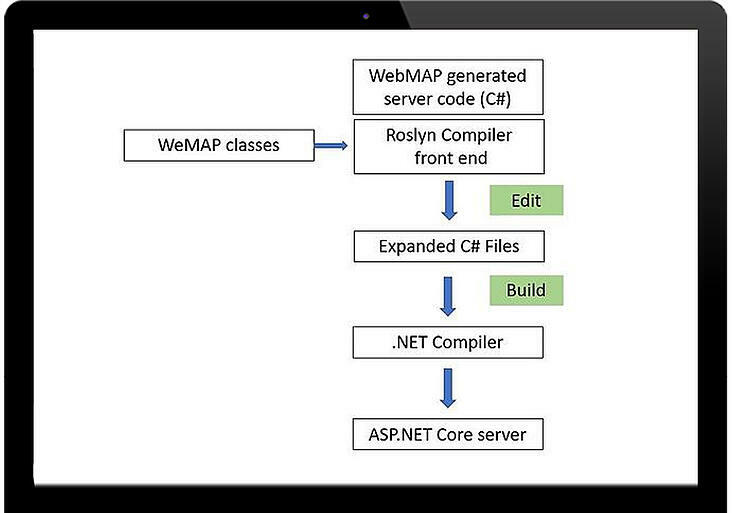 WebMAP takes advantage of the open-source "Roslyn" compiler platform in Visual Studio. Among other things, this platform offers real-time code parsing (which is how Intellisense works). 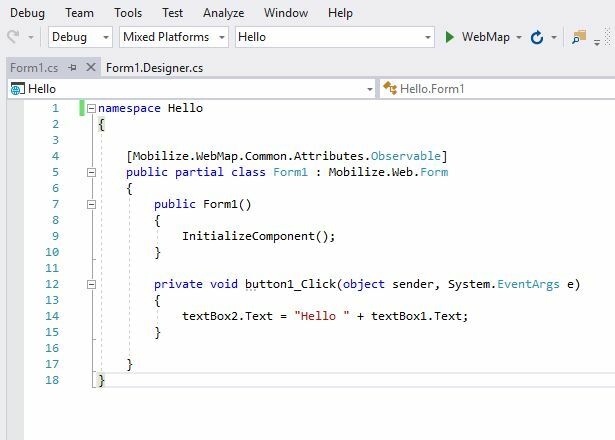 WebMAP uses that capability to inject code from helper classes into "Intercepted" code and create new, expanded C# files. Since the compiler front end is running all the time, as you edit those user-facing C# files, these expanded C# files are always being changed as well. Press F5 to kick off a build and the compiler knows to use the expanded files--not the files you were editing--for the build process. Injecting these classes where necessary is what we mean when we talk about "weaving." Ok, that sounds really complicated. But it's not really. And in the 3rd installment of this overly-long blog, I'll explain why.